Circulating levels of fibroblast growth factor 23 (FGF23) increase during the early stages of kidney disease, but the underlying mechanism remains incompletely characterized. We investigated the role of vitamin D metabolites in regulating intact FGF23 production in genetically modified mice without and with adenine-induced uremia. Exogenous calcitriol (1,25-dihydroxyvitamin D) and high circulating levels of calcidiol (25-hydroxyvitamin D) each increased serum FGF23 levels in wild-type mice and in mice with global deficiency of the Cyp27b1 gene encoding 25-hydroxyvitamin D 1-α-hydroxylase, which produces 1,25-hydroxyvitamin D. Compared with wild-type mice, normal, or uremic mice lacking Cyp27b1 had lower levels of serum FGF23, despite having high concentrations of parathyroid hormone, but administration of exogenous 1,25-dihydroxyvitamin D increased FGF23 levels. Furthermore, raising serum calcium levels in Cyp27b1-depleted mice directly increased FGF23 levels and indirectly enhanced the action of ambient vitamin D metabolites via the vitamin D receptor. In chromatin immunoprecipitation assays, 25-hydroxyvitamin D promoted binding of the vitamin D receptor and retinoid X receptor to the promoters of osteoblastic target genes. Conditional osteoblastic deletion of Cyp27b1 caused lower serum FGF23 levels, despite normal circulating levels of vitamin D metabolites. In adenine-induced uremia, only a modest increase in serum FGF23 levels occurred in mice with osteoblastic deletion of Cyp27b1 (12-fold) compared with a large increase (58-fold) in wild-type mice. Therefore, in addition to the direct effect of high circulating concentrations of 25-hydroxyvitamin D, local osteoblastic conversion of 25-hydroxyvitamin D to 1,25-dihydroxyvitamin D appears to be an important positive regulator of FGF23 production, particularly in uremia. Although dietary phosphate (P),17–19 serum P,20 and calcium (serum Ca)20 are able to increase circulating levels of FGF23, the precise molecular mechanism whereby these ions regulate FGF23 is unclear. Serum Ca–mediated increases in serum FGF23 required a threshold level of serum phosphorus and, likewise, P-elicited increases in FGF23 were markedly blunted if serum Ca was below a threshold level.20 Consequently, the best correlation between Ca and P and serum FGF23 was found between FGF23 and the Ca×P product.20 Nevertheless, the use of a Ca×P product as a determinant of a physiologic or pathologic event has been questioned, particularly as it relates to ectopic calcification.21 Iron deficiency may also cause high levels of both intact and carboxy-terminal FGF23.22 In addition, circulating FGF23 levels increase very soon after kidney disease occurs23; however, the mechanism underlying this early rise is poorly understood. Finally, several local bone-derived factors, such as PHEX, DMP1, and MEPE, may act in an autocrine/paracrine mode to regulate FGF23 expression in bone.24 Nevertheless, their mechanism of regulating FGF23 production still remains to be determined. Thus, a complete lack of DMP1 in the context of normal renal function results in increased circulating levels and bone expression of FGF23.25,26 However, overexpression of DMP1 does not cause the inverse phenotype, that is, DMP1 excess does not suppress FGF23 expression.27,28 Furthermore, a simultaneous increase in both DMP1 and FGF23 expression was reported in osteocytes of patients with CKD, which also appears contrary to the concept that DMP1 acts to suppress FGF23 expression.29 1,25(OH)2D has been reported to regulate FGF23 expression by repressing DMP1 via the VDR pathway;30 however, in a study in dialysis patients treated with active vitamin D, bone-intact FGF23 increased but DMP1 fragments were altered with therapy.31 Consequently, further understanding of the effects of DMP1 fragments on FGF23 production and the role of vitamin D in mediating this effect appears to be needed. Vitamin D is derived either via ultraviolet irradiation of a skin precursor, or via intestinal absorption from the diet, and can then be enzymatically converted in the liver to calcidiol (25-hydroxyvitamin D [25(OH)D]), the most abundant circulating vitamin D metabolite. Subsequently, CYP27b1, encoding 25-hydroxyvitamin D 1α-hydroxylase (1[OH]ase), converts 25(OH)D to its active form, 1,25(OH)2D, in the kidney. Although extrarenal skeletal 1(OH)ase has been described,34,35 its exact function is unclear. Alternatively, 25(OH)D, and also 1,25(OH)2D, can be 24-hydroxylated by a 25-hydroxyvitamin D 24-hydroxylase (24[OH]ase) enzyme, CYP24A1, as a first step in the catabolism of these vitamin D metabolites. In a negative feedback loop, 1,25(OH)2D can inhibit renal CYP27B1, but 1,25(OH)2D can also stimulate renal CYP24A1, thus reducing further 1,25(OH)2D synthesis and enhancing its own elimination in order to maintain appropriate circulating levels of 1,25(OH)2D.36 FGF23 also acts at the proximal renal tubule to downregulate the expression of CYP27B1 and stimulate the expression of CYP24A1.37,38 Decreases in CYP27B1 activity due to FGF23 may also result from a defect in translational or post-translational modification of the enzyme.39 The decreased circulating 1,25(OH)2D that occurs as a consequence of these actions of FGF23 can then decrease intestinal Ca absorption. Although local production of 1,25(OH)2D by bone cells has been hypothesized to contribute to regulation of FGF23 production,48 direct evidence for an autocrine function of 1,25(OH)2D in this regulation has not yet been reported. In this study, we used genetically engineered mouse models to assess the role of vitamin D metabolites in FGF23 regulation, and probed the contribution of skeletal 1(OH)ase−/− in modulating FGF23 production in the presence and absence of renal dysfunction. Serum Ca and P levels were significantly reduced and PTH levels elevated in the 1(OH)ase−/− mice and the VDR−/− mice on a high-Ca diet compared with wild-type (WT) mice (Figure 1, A–C). Serum Ca, P, and PTH were normalized on the rescue diet compared with the high-Ca diet. 1,25(OH)2D levels were undetectable in the 1(OH)ase−/− mice on either diet and were elevated in the VDR−/− mice on both diets (not shown), as previously described.49 FGF23 levels were low in the 1(OH)ase−/− mice on the high-Ca diet (Figure 1D) in association with the undetectable circulating 1,25(OH)2D, even though PTH levels were elevated (Figure 1C). When the 1(OH)ase−/− mice were fed a rescue diet (1(OH)ase−/−R) and serum Ca and P were normalized, FGF23 levels rose despite a fall in PTH levels and an undetectable level of 1,25(OH)2D (Figure 1D). Consequently, PTH did not seem to be a critical determinant of FGF23 levels in this setting. In the VDR−/− mice, FGF23 levels were low on the high-Ca diet even in the presence of high circulating 1,25(OH)2D, indicating that the effect of 1,25(OH)2D required the VDR. FGF23 levels rose in the VDR−/− mice on the rescue diet, but remained significantly below normal levels. Therefore, although the rescue diet in the 1(OH)ase−/−R mice resulted in a restoration of FGF23 to WT levels, FGF23 levels were only increased to 25% of WT levels in the VDR−/−R mice. In view of the fact that the serum Ca and P were not significantly different in the 1(OH)ase−/−R mice on the rescue diet and the VDR−/−R mice on the rescue diet, it therefore seemed likely that endogenous 25(OH)D in the 1(OH)ase−/− mice might be able to bind to the VDR and further increase FGF23 above the levels seen in the VDR−/− mice. Circulating FGF23 is influenced by serum calcium and VDR levels. Basal serum biochemical parameters of WT, VDR−/−, and 1(OH)ase−/− mice. Serum Ca, P, PTH, and FGF23 are shown in panels (A–D), respectively. WT mice were maintained on normal chow. 1(OH)ase−/− and VDR−/− mice were maintained either on a high-Ca diet or a rescue diet, denoted as 1(OH)ase−/−C and VDR−/−C, and 1(OH)ase−/−R and VDR−/−R, respectively. Bars represent the mean±SEM of measured data from six to eight animals of each genotype. ♦♦♦P < 0.001 compared with age-matched WT; ***P<0.001 and **P≤0.01 compared with mice of the same genotype on a high-Ca diet. In WT mice, treatment with exogenous 1,25(OH)2D for 1 week increased FGF23 above control levels 24 hours after the treatment (Figure 2A). A lesser increase in FGF23 was seen in the WT mice after 1 week of treatment with 25(OH)D. No increase in serum Ca was observed after 1 week of treatment (Figure 2C). In the 1(OH)ase−/− mice on a high-Ca diet, treatment for 1 week with exogenous 1,25(OH)2D significantly raised FGF23 above levels in the untreated 1(OH)ase−/− mice, but not to levels above those in the untreated WT mice. Exogenous 25(OH)D treatment for 1 week had no significant effect. No change in serum Ca was observed after one week of treatment with 1,25(OH)2D or with 25(OH)D in WT or in 1(OH)ase−/− mice (Figure 2D). After 2 months of treatment with exogenous 1,25(OH)2D, a stable and sustained increase in FGF23 levels was seen (Figure 2B). This may have reflected, at least in part, the normalization of the Ca level (Figure 2C). In the untreated 1(OH)ase−/− mice on the rescue diet, with normalization of serum Ca (Figure 2C), FGF23 serum levels increased above levels in the untreated 1(OH)ase−/− mice on a high-Ca diet but rose even further after only 1 week of 1,25(OH)2D treatment, suggesting that normalization of the Ca enhanced the action of 1,25(OH)2D. Exogenous 25(OH)D also produced a significant increase in FGF23 in 1(OH)ase−/− mice on the rescue diet, but not to the levels seen with exogenous 1,25(OH)2D (Figure 2B). FGF23 increases induced by vitamin D metabolites are enhanced by increasing the serum calcium. Comparison of the FGF23 responses to exogenous 1,25(OH)2D and 25(OH)D treatment of WT mice (A) and of 1(OH)ase−/−C mice (on a high-Ca diet) and 1(OH)ase−/−R mice (on a rescue diet) (B). Serum Ca levels are shown in WT mice (C) and in 1(OH)ase−/−C and 1(OH)ase−/−R mice (D) after treatment with 1,25(OH)2D and 25(OH)D. Intraperitoneal injections of 1,25(OH)2D (6 ng/g) or 25(OH)D (100 ng/g) were given every 2 days for 1 week. Alternatively, exogenous 1,25(OH)2D (50 pg/g) was administered for 2 months (2M) to 1(OH)ase−/−C mice (on a high-Ca diet). Bars represent the mean±SEM. Significant differences between groups were determined by one-way ANOVA followed by Bonferroni test. *P≤0.05; **P≤0.01; ***P≤0.001; and ****P≤0.0001 compared with vehicle-treated mice of the same genotype on the same diet; ‡P≤0.05 compared with 1(OH)ase−/−C mice. We postulated that the attenuated response of FGF23 to exogenous treatment with 1,25(OH)2D and 25(OH)D in 1(OH)ase−/− mice on a high-Ca diet, relative to the rescue diet, could be associated with a defect in VDR expression. We therefore examined VDR expression in bone by immunohistochemistry (Figure 3). The VDR was expressed in osteoblastic cells of WT mice but not in osteoblastic cells of VDR−/− mice (Figure 3, A and D). VDR expression was low in the bones of 1(OH)ase−/− mice on a high-Ca diet but expression was partly restored in the 1(OH)ase−/− mice on a rescue diet (Figure 3, B and E). Treatment with 1,25(OH)2D for 1 week increased VDR expression slightly in 1(OH)ase−/− mice on a high-Ca diet (Figure 3C). One week of 1,25(OH)2D treatment of 1(OH)ase−/− mice on a rescue diet, however, produced the greatest increase in VDR expression (Figure 3F), to levels above those seen with the rescue diet alone. Increased VDR expression in osteoblasts is induced by 1,25(OH)2D and further amplified by increasing serum calcium. Representative sections of VDR expression in bone analyzed by immunohistochemistry of femur from WT, VDR−/−, and 1(OH)ase−/− mice. The decalcified bone tissue was paraffin-embedded and stained for antibodies to VDR. Positive labeling for VDR in WT mice on normal chow is clearly evident in brown and denoted by black arrows (A). VDR expression in VDR−/− mice on a rescue diet was a negative control and showed no staining (D). VDR expression in femurs of 1(OH)ase−/− mice on a high-Ca diet contained undetectable to low levels of VDR (B), and no change was observed after treatment with exogenous 1,25(OH)2D (C). VDR expression in 1(OH)ase−/− mice was upregulated by a rescue diet (E) and increased further after exogenous treatment with 1,25(OH)2D (F). Original magnification, ×300 in A and D; ×200 in B, C, E, and F.
In view of the capacity of high concentrations of exogenous 25(OH)D to increase serum FGF23 levels in the global absence of 1α(OH)ase−/−, we assessed whether 25(OH)D might directly interact with the VDR in modulating VDR-mediated gene transcription. Chromatin immunoprecipitation (ChIP) analysis showed that 1,25(OH)2D, as well as 25(OH)D, can promote the binding of VDR and RXR to the VDRE in the promoter of several osteoblast target genes of 1,25(OH)2D, including osteopontin, osteocalcin, and Cyp24A1 (Figure 4A), as well as FGF23 (Figure 4B), suggesting that at least part of the effect of 25(OH)D might be by direct interaction with the osseous VDR. 1,25(OH)2D and 25(OH)D stimulate VDR and RXR recruitment to the VDRE site on the promoters of osteoblastic proteins. Chromatin was extracted from intact MC3T3 or UMR106 osteoblastic cells that had been treated with vehicle or 10–7 M 1,25(OH)2D or 10 –6 M 25(OH)D for 2 hours, in the presence of 25 mM ketoconazole to inhibit 1-hydroxylation of 25(OH)D. Extracts were then crosslinked and subjected to immunoprecipitation with VDR or RXR antibody. Nonimmunoprecipitated (Input) and Immunoprecipitated DNA from MC3T3-E3 cells were subjected to PCR using specific primers designed according to the VDRE site located in the promoter region of the target genes osteopontin, osteocalcin, and Cyp24a1 (A). PCR products were analyzed using 2% agarose gels, and representative agarose gels of 2–3 independent experiments are shown. Control was DNA immunoprecipitated with IgG. For assessment of VDR and RXR recruitment to the promoter of the FGF23 gene chromatin extracted from UMR106 cells and DNA immunoprecipitated by ChIP assay as above were analyzed by qPCR using a SsoFast-EvaGreen real-time PCR kit. Expression was normalized to the expression of input. Values represent results of three independent experiments (B). We next assessed whether, in addition to direct interaction with the VDR, part of the effect of the exogenous 25(OH)D administered to WT mice might also have been due to intraosseous, rather than to renal, conversion to 1,25(OH)2D3 with subsequent interaction with the osseous VDR. To examine this issue, we used an osteoblast-specific 1(OH)ase−/− mouse, (OB-1[OH]ase−/−) using an osteocalcin promoter–driven Cre recombinase to delete Cyp27b1 from mature osteoblastic cells. Circulating levels of 1,25(OH)2D, as well as serum Ca, P, and PTH, did not differ significantly in OB-1(OH)ase−/− mice from values in WT mice (Figure 5, A–D, respectively). Circulating FGF23 levels, however, were significantly lower in the OB-1(OH)ase−/− mice than in WT mice (Figure 5E). 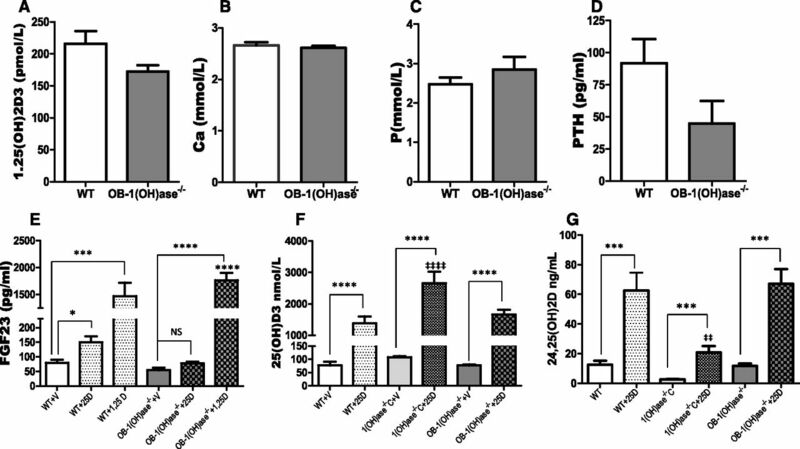 Circulating FGF23 levels, are reduced in non-uremic mice deficient in osteoblastic 1(OH)ase and are increased by exogenous 1,25(OH)2D but not 25(OH)D. Serum biochemistry of OB-1(OH)ase−/− mice. WT and OB-1(OH)ase−/− mice were maintained on normal chow and were euthanized at 3 months of age. Blood was collected for biochemical assays as described in Concise Methods. Serum 1,25(OH)2D (A), Ca (B), P (C), PTH (D), FGF23 (E), 25(OH)D (F), and 24,25(OH)2D (G) are shown in WT, 1(OH)ase−/−C, and OB-1(OH)ase−/− mice after treatment with vehicle (V) or with exogenous 1,25(OH)2D (6 ng/g every 2 days for 1 week) or with 25(OH)D (100 ng/g every 2 days for 1 week). Bars represent the mean±SEM of 6–8 animals per group; significant differences between groups were determined by one-way ANOVA followed by Bonferroni test. *P≤0.05; ***P<0.001; and ****P≤0.001 relative to mice of the same genotype on the same diet; ‡P≤0.05; ‡‡P≤0.01; and ‡‡‡‡P≤0.001 compared with WT mice. Specific osteoblastic deletion of 1(OH)ase did not affect the FGF23 response to treatment with exogenous 1,25(OH)2D, and a robust increase in FGF23 levels, comparable to that in WT mice, was seen. In contrast, exogenous 25(OH)D failed to increase FGF23 levels in these mice (Figure 5E). Neither 1,25(OH)2D nor 25(OH)D increased the serum Ca (data not shown). Administration of 25(OH)D significantly increased the serum 25(OH)D levels in WT, global, and bone-specific 1(OH)ase−/− mice relative to vehicle-treated control mice of the same genotype (Figure 5F). However, after administration of the same dose of 25(OH)D, global 1(OH)ase−/− mice had significantly higher circulating levels of 25(OH)D and lower circulating levels of 24,25(OH)2D than in the WT and OB-1(OH)ase−/− mice (Figure 5G). In view of the fact that FGF23 levels rise dramatically in the presence of renal dysfunction, we used a mouse model of CKD to examine the regulation of FGF23 by vitamin D in this setting. Adenine administration to WT mice for 5 weeks produced, approximately, a tripling in serum urea nitrogen (Figure 6A), no significant change in serum Ca (Figure 6B), and a rise in serum P (Figure 6C). 1,25(OH)2D levels fell to about 30% of the levels in nonadenine-treated WT mice (Figure 6D), and PTH levels increased (Figure 6E). FGF23 levels increased markedly (Figure 6F). When we induced uremia with adenine in the global 1(OH)ase−/− mice, serum urea nitrogen rose, Ca rose, P rose, and PTH levels rose dramatically. FGF23 levels were, however, again low, despite the rise in PTH. We then examined FGF23 levels in the OB-1(OH)ase−/− mice in which we had induced renal dysfunction with adenine. Serum urea nitrogen rose (Figure 6A), Ca did not change (Figure 6B), P rose (Figure 6C), 1,25(OH)2D levels fell (Figure 6D), and PTH levels rose (Figure 6E), all to about the same levels as those seen in the adenine-treated WT mice. Nevertheless, serum FGF23 levels increased only 12-fold, compared with 58-fold in the WT mice, after inducing uremia (Figure 6F). The increased serum FGF23 levels in adenine-treated WT mice (Figure 6F) were associated with markedly increased FGF23 mRNA (Figure 6G). In contrast, adenine treatment of mice deficient in osteoblastic 1(OH)ase showed only a modest increase in FGF23 mRNA (Figure 6G). Consequently, osteoblastic 1(OH)ase appeared to contribute to increased circulating FGF23 at least in large part by increasing FGF23 gene expression via local 1,25(OH)2D production. Therefore, the osteoblastic 1α(OH)ase appeared to be a major regulator of FGF23 production in uremia and loss of only the osteoblastic 1α(OH)ase could account for most of the reduction of FGF23 which was observed in the global 1(OH)ase−/− mice. The FGF23 increase in uremic mice is absent after global deletion of the 1(OH)ase and markedly reduced after specific deletion of the osteoblastic 1(OH)ase. Comparison of biochemical abnormalities in adenine-induced CKD in WT, 1(OH)ase−/−C, and OB-1(OH)ase−/− mice. Serum urea nitrogen (A), Ca (B), P (C), 1,25(OH)2D (D), PTH (E), and FGF23 (F) levels are shown. Levels of mRNA encoding FGF23 extracted from long bone of WT and OB-1(OH)ase−/− mice and determined by qPCR are shown in (G) and serum 24,25(OH)2D levels in (H). Bars represent the mean±SEM of measured data from six to eight animals per group. Significant differences between adenine-treated mice compared with age-matched control mice on a regular diet were determined by one-way ANOVA followed by a Bonferroni test. *P≤0.05; **P≤0.01; ***P<0.001; and ****P≤0.0001 relative to mice of the same genotype on a regular diet; ♦P<0.05 and ♦♦P<0.01 compared with age-matched WT mice on the same diet. The low levels of serum 24,25(OH)2D in the global 1(OH)ase−/− mice before and after administration of adenine supported the likelihood that 1,25(OH)2D was the major regulator of 24(OH)ase activity. Serum 24,25(OH)2D levels were also reduced in both WT and in OB-1(OH)ase−/− mice suggesting that the reduced 1,25(OH)2D levels after adenine administration decreased 24-hydroxylase activity (Figure 6H), Furthermore, the reduction of serum 24,25(OH)2D in the WT mice occurred despite elevated circulating FGF23 levels indicating that increased FGF23 had failed to increase 24(OH)ase activity. A model of FGF23 regulation by mediators examined in this study is presented in Figure 7. 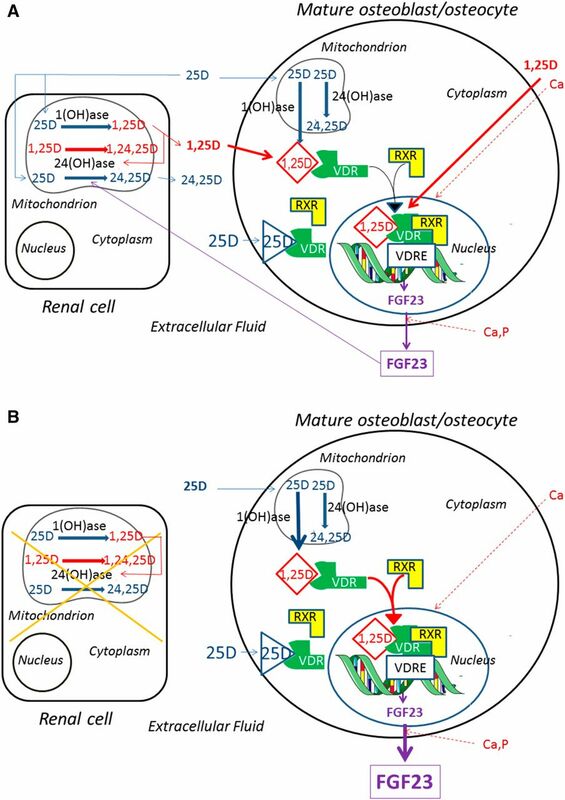 Model of the regulation of FGF23 by vitamin D metabolites and minerals showing the important role of renal-derived and osteoblast- derived 1,25(OH)2D. (A) In the presence of normal renal function. Circulating 25(OH)D can be converted in the kidney to 1,25(OH)2D via the 1(OH)ase (Cyp27b1). 1,25(OH)2D can stimulate 24(OH)ase and 25(OH)D can be degraded by the 24(OH)ase (Cyp24a1) to 24,25(OH)2D (24,25D). 1,25(OH)2D can also be converted to 1,24,25(OH)3D (1,24,25D) by the 24(OH)ase. 1,25(OH)2D can itself stimulate 24(OH)ase activity. Renal-derived circulating 1,25(OH)2D can then enter the mature osteoblast/osteocyte and bind the VDR which then complexes with the RXR. In the nucleus, this complex may bind to an FGF23 VDRE and increase FGF23 transcription, resulting in increased FGF23 production and release. Circulating 25(OH)D may also enter the mature osteoblast/osteocyte and be converted by the osteoblastic 1(OH)ase to 1,25(OH)2D or be degraded by the osteoblastic 24(OH)ase to 24,25(OH)2D. The intracellular 1,25(OH)2D produced from 25(OH)D by the osteoblast may act as an intracrine factor and bind to VDR and increase FGF23 production. At high circulating concentrations of 25(OH)D, this vitamin D metabolite may also act by directly binding to VDR and stimulating FGF23 production. Both Ca, by unknown mechanisms, and 1,25(OH)2D, by stimulation of transcription, can increase VDR concentrations and facilitate the actions of 1,25(OH)2D and 25(OH)D. Ca and P can increase FGF23 production by unknown mechanisms. (B) In the absence of renal function. Renal conversion of 25(OH)D to 1,25(OH)2D is impaired, and renal degradation of 25(OH)D is also impaired. Osteoblastic production of 1,25(OH)2D becomes the major source of 1,25(OH)2D in the mature osteoblast/osteocyte and a major regulator of FGF23 production. Circulating 25(OH)D levels may be influenced by nutritional intake of vitamin D as well as ultraviolet light–induced production of vitamin D.
In previous studies, Ca-mediated increases in serum FGF23 in vivo required a threshold level of serum P, and P-elicited increases in FGF23 were markedly blunted if serum Ca was below a threshold level.20 However, these changes appeared to occur in the absence of the Ca-sensing receptor.20 Furthermore, although extracellular Ca has been reported to increase FGF23 levels in vitro via L-type voltage-sensitive Ca channels in osteoblastic MC3T3-E1 cells50; in vitro studies in another osteoblastic cell line, ROS17/2.8, failed to show an effect of extracellular Ca on the regulation of FGF23 expression.8 The results of this study demonstrate that raising serum Ca and/or serum P levels in the VDR−/− mice on the rescue diet increased FGF23 levels independent of any VDR-mediated action, providing further evidence for mineral regulation of FGF23; however the precise mechanism remains unclear. 1,25(OH)2D has also been reported to increase VDR gene expression in the kidney and parathyroid gland,53–57 and addition of exogenous 1,25(OH)2D to 1(OH)ase−/− mice on a rescue diet further enhanced skeletal VDR expression over the effect of normalizing the serum Ca alone. Therefore, circulating 1,25(OH)2D appears to regulate FGF23 production by enhancing VDR expression and, most likely, by stimulating gene transcription over and above any effect of ambient Ca. It has previously been reported that the FGF23 response to acute treatment with an active vitamin D analog, doxercalciferol, was delayed in hypocalcemic 1(OH)ase−/− mice, although a robust response was seen after 10 weeks, suggesting that 1,25(OH)2D and PTH could stimulate FGF23 only if a state of hypocalcemia was not present.50 On the basis of our results, the delayed FGF23 response in that study could be explained by defective VDR expression in bone and the delay required to normalize Ca levels and VDR expression after administration of exogenous 1,25(OH)2D. The same dose of exogenously administered 25(OH)D was more effective in stimulating FGF23 in global 1(OH)ase−/− mice on a rescue diet than in the WT or OB-1(OH)ase−/− mice. This may have reflected direct ligand binding activity of the higher circulating concentrations of 25(OH)D achieved in the global 1(OH)ase−/− mice compared with the WT or OB-1(OH)ase−/− mice. These higher 25(OH)D concentrations were accompanied by lower 24,25(OH)2D levels in the global 1(OH)ase−/− mice compared with WT or to OB-1(OH)ase−/− mice. This is consistent with decreased 24(OH)ase activity in the global knockout49 and suggests that renal, rather than osteoblastic, 24(OH)ase is a major determinant of circulating 24,25(OH)2D levels, as it is for circulating 1,25(OH)2D, and that 1,25(OH)2D generated by the kidney is an important regulator of renal Cyp24A1 expression. High levels of circulating 25(OH)D may also arise from very high dietary intake and, in this regard, in a double-blinded trial in healthy volunteers treated with daily oral cholecalciferol or placebo, FGF23 increased significantly in the cholecalciferol-treated group but not in the placebo group.58 A randomized trial in hemodialysis patients comparing ergocalciferol with placebo showed that FGF23 increased significantly between baseline and week 12 but there were no significant changes in FGF23 between treated and control groups.59 In a randomized, controlled trial of cholecalciferol in hemodialysis patients, low 25(OH)D levels were restored to normal and 1,25(OH)2D levels increased but PTH did not fall and FGF23 did not increase,60 despite the fact that activated vitamin D compounds have been shown to decrease PTH and increase FGF23 in dialysis patients.61 To date, there are no trials of 25(OH)D treatment in dialysis patients. Conflicting results have been obtained regarding the role of PTH in stimulating FGF23 production. Thus, several in vivo and in vitro studies have demonstrated that PTH increases FGF23 mRNA levels by interacting directly with the type 1 PTH receptor on osteocytes and on osteoblastic UMR106 cells.10,11 FGF23 has also been reported to be increased in vivo in mice and humans with hyperparathyroid states.62–65 Thus, secondary hyperparathyroidism is a characteristic consequence of CKD and the increased circulating PTH is believed to enhance FGF23 production in this disorder. Furthermore, studies in rats with experimental uremia suggested that secondary hyperparathyroidism is necessary for the induction of the high FGF23 levels in animals with CKD. It has also been reported that the PTH stimulating effect on FGF23 was partly mediated by inhibiting sclerostin and thereby increasing Wnt-signaling.10 However, these studies did not address the increase of FGF23 at early stages of CKD before secondary hyperparathyroidism can be detected. Indeed, increases in bone sclerostin and FGF23 both occur early in CKD before elevations in serum PTH are observed,66,67 and can be increased by active vitamin D compounds.29 Furthermore, although rapid increases in both PTH and FGF23 have been reported after inducing AKI, osteocyte-specific deletion of the type 1 PTH receptor and ablation of PTH did not prevent the large elevations of FGF23 levels in response to AKI induction suggesting that the increases in FGF23 occurred independent of PTH-signaling and of PTH.23 Other studies, using calvarial cells isolated from uremic rats, demonstrated that FGF23 synthesis is regulated directly by 1,25(OH)2D but not by PTH.68 In our studies, in mice with normal renal function, we show that exogenous 1,25(OH)2D could stimulate FGF23 in the presence of suppressed PTH; additionally, in the absence of 1,25(OH)2D in nonuremic mice with global 1α(OH)ase deletion on a high-Ca diet, FGF23 was reduced despite the presence of high concentrations of PTH. Furthermore, FGF23 failed to increase in adenine-induced uremia in global 1(OH)ase−/− mice in the presence of severe hyperparathyroidism. Consequently, ambient concentrations of active vitamin D appear to supersede the effects of PTH on regulating FGF23. We also found that osteoblastic 1(OH)ase activity alone appeared to play an important role in increasing FGF23 release. Thus, FGF23 levels were reduced in mice with conditional deletion of osteoblastic 1(OH)ase and normal renal function, compared with WT mice with normal renal function, even in the presence of normal circulating 1,25(OH)2D levels. Furthermore, in the presence of uremia, the importance of osteoblastic 1 (OH)ase in the production of FGF23 was even more pronounced, in view of the fact that its absence resulted in only a modest increase in FGF23 in uremic mice with conditional osteoblastic 1(OH)ase deletion, compared with the increase seen in the uremic WT mice. After adenine treatment of global 1(OH)ase−/− mice, 24,25(OH)2D levels were lower than in adenine-treated mice with an absence of osteoblastic 1(OH)ase, again consistent with a role for renal-derived or circulating 1,25(OH)2D as the major determinant of 24(OH)ase activity. Furthermore, after adenine treatment of WT mice, 24,25(OH)2D levels were similar to those of adenine-treated OB-1(OH)ase−/− mice. This occurred despite higher serum FGF23 levels in the WT mice. Consequently, FGF23 does not appear to be a major activator of 24(OH)ase activity in uremia and “resistance”69,70 to effects of elevated FGF23 on 24(OH)ase in CKD may, at least in part, be due to decreased renal 1,25(OH)2D production in CKD, which then limits the capacity of FGF23 to increase 24(OH)ase activity. Therefore, in addition to the direct effect of high circulating concentrations of 25(OH)D, local osteoblast activation of 25(OH)D to 1,25(OH)2D, even at normal circulating 25(OH)D and 1,25(OH)2D concentrations, appears to be an important positive regulator of FGF23 production and this effect appears even more significant in uremia. All animal experiments were carried out in compliance with, and after approval by the Institutional Animal Care and Use Committee of McGill University and followed the guidelines of the Canada Council on Animal Care. Male WT mice (C57BL/6 background) were purchased from Charles River. 1(OH)ase−/− mice expressing the null mutation for the 1(OH)ase enzyme and which exhibit tissue-wide inability to synthesize 1,25(OH)2D have previously been described.69 To determine the 1(OH)ase−/− genotype, genomic DNA was isolated from tail fragments and analyzed as previously described.71 Mice were weaned at 3 weeks old and were maintained on either a high-Ca diet containing 1.5% Ca in the drinking water and regular autoclaved chow containing 1% Ca, 0.85% phosphorus, 0% lactose, and 2.2 units/g vitamin D, or a “rescue diet” (TD96348; Teklad, Madison, WI) of γ-irradiated chow containing 2% Ca, 1.25% phosphorus, 20% lactose, and 2.2 units/g vitamin D.
VDR-knockout mice were bred from heterozygote breeders purchased from The Jackson Laboratory (Bar Habor, ME). Genomic DNA was isolated from mouse tails and genotyped using the primers and protocol provided. VDR-knockout mice were weaned at 3 weeks of age and were also maintained on a high-Ca diet or a rescue diet. To generate mice lacking 1(OH)ase in mature osteoblasts and osteocytes (OB-1[OH]ase−/−), osteocalcin-Cre (Oc-Cre) mice (generously provided by Dr. T. Clemens) were mated with mice homozygous for a floxed Cyp27b1 allele,72 derived from mice originally from Dr. Rene St. Arnaud (McGill University, Montreal, Canada). For genotyping, genomic DNA was isolated from mouse tail and analyzed by PCR, as described previously for the Oc-Cre transgene73 and floxed-Cyp27b171 using reverse primer (R-primer) (5′-TGCAGACCAGTTTAAAAGTGGGCC) and forward primer (F-primer) (5′-TCCCAGACAGAGACATCCGTGTAGG). Mice were maintained on standard chow or on an adenine diet to induce kidney injury. A CKD mouse model was developed by adapting the original rat model of T. Yokozawa74 with modifications for use in mice. Briefly, male WT, 1(OH)ase−/− and OB-1(OH)ase−/− 8-week-old mice were kept on a regular diet containing 0.25% adenine (Harlan Teklad, Madison, WI) for 5 weeks and then sacrificed. Serum and bone were collected for analysis. To compare the FGF23 response with exogenous 1,25(OH)2D or to 25(OH)D, WT and OB-1(OH)ase−/− mice were maintained on regular chow and 1(OH)ase−/− mice on a high-Ca diet and treated with 6 ng/g of 1,25(OH)2D or with 100 ng/g of 25(OH)D every 2 days for 1 week. To further investigate the role of VDR expression in the FGF23 response with exogenous 1,25(OH)2D or 25(OH)D, two additional groups of 1(OH)ase−/− mice were added. In the first group, 1(OH)ase−/− mice were maintained on a high-Ca diet and then treated with 50 pg/g of 1,25(OH)2D (IP) for 2 months; in the second group, 1(OH)ase−/− mice were maintained on a rescue diet from weaning then treated with 6 ng/g of 1,25(OH)2D or 100 ng/g of 25(OH)D every 2 days for 1 week. Serum was collected 24 hours after the last dose for biochemistry analysis. Control mice were treated with vehicle (saline/propylene glycol/ethanol in a ratio of 40:50:10, respectively). Blood was collected 24 hours after the last treatment and serum was obtained by centrifugation at 3000 rpm and stored at −80°C before assay. Serum biochemistry for Ca and P were determined by autoanalyzer (Beckman Synchron 67; Beckman Instruments). Serum urea nitrogen was measured by the Diagnostic Laboratory of the Animal Resource Center of McGill University, using a colorimetric assay. Mouse intact PTH, 1,25(OH)2D, and intact-FGF23 were measured by ELISA according to the manufacturer’s protocol (ImmunoDiagnostic Systems, Fountain Hills, AZ; Immunotopics, San Clemente, CA; and Kaino, Tokyo, Japan, respectively). Serum 24,25(OH)2D was measured by Heartland Assays LLC (Ames, IA) by liquid chromatography/mass spectrometry. Serum 25(OH) D was measured by enzyme immunoassay (Immunodiagnostic Systems Ltd., Boldon, UK). Tissues were collected and fixed overnight in periodate-lysine-paraformaldehyde fixative solution and placed in 70% ethanol. Fixed tissues were embedded in paraffin and sectioned. For bone immunohistochemistry, femur sections from six to eight mice per experimental group were fixed in periodate-lysine-paraformaldehyde and decalcified before embedding in paraffin. The VDR-D6 antibody (sc13133; Santa Cruz Biotechnology, Santa Cruz, CA) was applied to dewaxed paraffin sections overnight. After washing with high-salt buffer, slides were incubated with secondary antibody, washed, and processed using the Vectastain ABC-AP kit (Vector Laboratories, Burlingame, CA) and mounted with Permount (Fisher Scientific, Waltham, MA). Images from 4 to 6 sections were processed blindly using image analysis software (Bioquant Image Analysis, Nashville, TN). Total RNA was extracted from long bone using the TRIzol reagent (Invitrogen, Carlsbad, CA) following the manufacturer’s protocol, reverse transcribed into cDNA using SuperScript II, and analyzed by real-time PCR, using F-primer 5′-CACTGCTAGAGCCTATTC and R-primer 5′-CACTGTAGATAGTCTGATGG. Relative expression values were evaluated with the 2–ΔΔCt method and values were normalized to GAPDH signals. cDNAs from three independent experiments were analyzed. To determine whether 25(OH)D might exert direct actions on target genes independent of 1,25(OH)2D, we examined the capacity of 25(OH)D to recruit the VDR to the promoter regions of the target genes osteopontin, osteocalcin, and 24 hydroxylase in mouse MC3T3-E3 osteoblastic cells using a ChIP assay in the presence of 25 μM ketoconazole to inhibit 1α hydroxylation. MC3T3-E3 cells were maintained in α-modified MEM (α-MEM), containing 10% FBS and changed to α-MEM containing 2% charcoal-stripped FBS 24 hours before the ChIP assay. The capacity of 25(OH)D to recruit the VDR to the promoter region of FGF23 was investigated in a rat osteoblastic cell line, UMR-106. UMR-106 cells were maintained in DMEM Nutrient Mixture F-12 (DMEM-F12) Media supplemented with 10% FBS. Medium was replaced by serum-free DMEM-F12 overnight and changed to DMEM-F12 containing 2% charcoal-stripped FBS for ChIP assay. For the assays, both cell lines were pretreated for 2 hours with 25 μM of ketoconazole (Sigma-Aldrich, St Louis, MO) to inhibit 1-hydroxylation of 25(OH)D and treated for 2 hours with 10−7 M 1,25(OH)2D, 10−6 M of 25(OH)D, or vehicle. ChIP assay was performed with a commercial kit (Upstate, Temecula, CA) following the protocol provided. Briefly, nuclear proteins were crosslinked to DNA by adding formaldehyde (Sigma-Aldrich, #F8775) directly to the cultures to a final concentration of 1% and incubated for 10 minutes at 37°C. Cells were washed and resuspended in 200 μl of SDS lysis buffer. Sonicated cells containing sheared DNA were centrifuged at 13,000 rpm at 4°C to obtain cleared cell lysate. The lysates were diluted with ChIP dilution buffer and protease inhibitor cocktail (Roche, Basel, Switzerland). A portion (2%) of the diluted lysate was taken as input/starting material to quantify the amount of DNA present in different samples. To reduce nonspecific background, samples were precleared by incubating with 75 μl of protein A-agarose/salmon sperm DNA 50% slurry for 30 minutes at 4°C with agitation, centrifuged briefly at 4°C to collect the supernatant, and the histone DNA complex was immunoprecipitated by overnight rotation-incubation at 4°C with 4 μg of either primary antibody, anti-VDR (N-20) and anti-RXR (ΔN 197) (Santa Cruz Biotechnology), or with normal rabbit IgG as control. To collect the antibody, histone or DNA complex, 60 μl of protein A-agarose/salmon sperm DNA 50% slurry was added. The protein A-agarose, antibody, histone, or DNA complex were rinsed sequentially with TSE I buffer, TSE II buffer, lithium chloride wash buffer (0.25 M lithium chloride, 1% NP-40, 1% deoxycholate [sodium salt]), 1 mM EDTA, 10 mM Tris hydrochloride (pH 8.1), and TE buffer. The A-agarose beads were eluted (1% SDS and 0.1 M sodium bicarbonate), the crosslinking was reversed by incubating at 65°C overnight, and purified eluates using a PCR purification kit (Qiagen, Germantown, MD). DNA sequences of mCyp24, m-osteopontin, and m-osteocalcin, associated with the VDR or RXR immunoprecipitates, were quantitated by PCR using specific primers designed according to the VDRE site located in the promoter region of 1,25(OH)2D target genes, i.e., mCyp24 (promoter region -236 to -51) F-primer 5′-GGTTATCTCCGGGGTGGAGT-3′ and R-primer 5′-GGTGGCCAATGAGCACGC (186 base pairs [bp]); m-osteopontin promoter region -757 to -743, F-primer 5′-ACCACCTCTTCTGCTCTATATGGC and R-primer 5′-TGACACTTGAGCTATGCAGCCGC (187 bp); m-ostecalcin F-primer5′-CTGAACTGGGCAAATGAGGACA; and R-primer 5′AGGGGATGCTGCCAGGACTAAT (403 bp). PCR products were analyzed using 2% agarose gel. DNA sequences of rFGF23 associated with the VDR or RXR immunoprecipitates were F-primer 5′-: CATTTCCTGATGGAAGTGGGACA and R-primer 5′-TTCAAGCCAGTGCTCTCATAAGT. cDNA and were analyzed by quantitative real-time PCR (qPCR) using a SsoFast-EvaGreen real-time PCR kit (Bio-Rad, Hercules, CA). Expression was normalized to the expression of input. All values are presented as means±SEM and statistical analyses were assessed using one-way ANOVA with Bonferroni multiple-group comparison after test (GraphPad Prism 5 Software; GraphPad Inc., San Diego, CA). The significance level was set at P≤0.05. This study was supported by a grant from the Canadian Institutes for Health Research to D.G. See related editorial, “The Pas de Trois of Vitamin D, FGF23, and PTH,” on pages 393–395.